GHEORGHE: "Ladies and gentlemen … we are just moments away from tonight’s main event.. and what a show we’ve had here at Boise State University!" JIVE: "The night is almost at an end .. after all that’s happened here tonight already … this is the match that I’ve been most looking forward to!" GHEORGHE: "The Television championship is on the line as "the Druid" Erik Black will defend the belt against one of, if not THE, greatest Television champions of all time … Mr. Entertainment." JIVE: "The Television championship belongs around the waist of Mr. Entertainment… he was born to wow the crowds." GHEORGHE: "He’ll have his shot … let’s go over to Jamie for tonight’s main event!" LINKS: "The following match is scheduled for one fall … and is for the New ERA of Wrestling TELEVISION CHAMPIONSHIP!" LINKS: "Introducing first… the challenger.."
LINKS: "He stands six foot two and weighs 234 pounds … hailing from Ashland, Oregon …. He is a former Television champion….. MISTER ……. ENTERTAINMENT!" GHEORGHE: "Entertainment reveling in the crowd’s reaction … he’s looking more and more like the man who wore the Television championship so proudly." JIVE: "Is there any doubt, Gheorghe?! Mr. Entertainment IS the most electrifying superstar in New ERA today!" 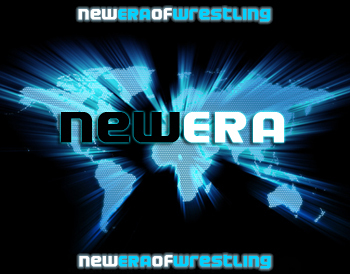 LINKS: "Introducing next… the New ERA of Wrestling TELEVISION CHAMPION …." (SFX: Bubbling water... followed by obnoxious coughing! LINKS: "Hailing from Indianapolis, Indiana… he stands five foot ten and weighs 210 pounds…… "THE DRUID" …… ERIK …… BLACK!!" JIVE: "Look at this nut." GHEORGHE: "The Television champion certainly puts on a show!" GHEORGHE: "The referee taking the belt …." JIVE: "Let’s get ‘er done, Mr. Entertainment!" GHEORGHE: "Erik Black slowly walking around the ring as Mr. Entertainment watches him from the center." JIVE: "All Entertainment has to do is stand there … with the pace Black is walking, you’d think he done smoke himself silly before coming out here." GHEORGHE: "The Television champion turns to Mr. Entertainment… and the two men tie up in the center of the ring!" JIVE: "Mr. Entertainment has the height advantage.. and he’s using it!" GHEORGHE: "Entertainment, the taller of the two, powering Erik Black … and Black is on his knees! Mr. Entertainment releases the hold … and he smacks Black across the face!!" JIVE: "The idiots didn’t take too kindly to that!" GHEORGHE: "Entertainment gloating … AND BLACK SHOOTS UP AND SPEARS THE FORMER CHAMPION!" GHEORGHE: "The Druid now pounding away on Mr. Entertainment… Black brings Entertainment to his feet … and whips him into the corner! Entertainment coming back out … AND ERIK BLACK WITH A DROPKICK SENDS MR. ENTERTAINMENT THROUGH THE ROPES!" JIVE: "Come on, ref! Mr. Entertainment clearly had a hold of the ropes there!" GHEORGHE: "Entertainment grabbing the apron as he gets to his feet … and he is not happy, Nick!" JIVE: "Would you be happy if the referee clearly let your opponent take a cheap shot?!" GHEORGHE: "There was no cheap shot there!" JIVE: "Oh so you’re on HIS side, huh?" GHEORGHE: "I’m not on anyone’s side!" JIVE: "That’s what they all say." GHEORGHE: "Entertainment back in the ring .. and he charges at the Television champion! Black ducks the clothesline … Entertainment turns … AND CATCHES THE BOOT OF BLACK!" JIVE: "Erik Black trying to take a shot to the midsection … but Mr. Entertainment too quick!" GHEORGHE: "BUT BLACK CONNECTS WITH THE ENZIGUIRI!" JIVE: "No!! He can’t do that!" GHEORGHE: "Erik Black crawling over to Mr. Entertainment and makes the cover…. ONE …. But Mr. Entertainment easily gets the shoulder up." JIVE: "It’s going to take a lot more than a cheap shot and an enziguiri to keep the former Television champion down." GHEORGHE: "The CURRENT Television champion now grabbing onto Entertainment’s legs... and he drops down … AIR ENTERTAINMENT!" JIVE: "When is the round over? Mr. Entertainment needs a moment to regroup!" GHEORGHE: "There are no "rounds," Nick." JIVE: "Well, we should have them for this match…. Starting now! Five minute breather!" GHEORGHE: "I don’t think so! Erik Black grabs the arm as Entertainment makes his way back to his feet … and he sends him into the ropes! Entertainment on the return.. and Black with the armdrag ... and turns it into an armbar!" JIVE: "That’s not quite the breather I was hoping for.."
GHEORGHE: "The referee asking Mr. Entertainment if he wants to submit.."
JIVE: "What is this, 1975?" GHEORGHE: "Black working on that shoulder .. and Mr. Entertainment trying to reach back and grab … anything … to get out." JIVE: "Pull on that greasy, mangy mop sitting on his head!" GHEORGHE: "Entertainment struggling … and, Nick, it looks like he … kind of took your advice!" GHEORGHE: "Entertainment yanking on the beard of the Television champion … and the referee warning Entertainment!" JIVE: "What! Don’t warn him! Warn the monkey who is trying to break his arm off!" GHEORGHE: "Entertainment not letting go … and finally Erik Black releases the armbar!" JIVE: "Thank God … but Mr. Entertainment has got to be more careful.. he could have been disqualified there .. and he can’t win back his bread and butter by getting himself disqualified!" GHEORGHE: "Entertainment scrambling over to the ropes .. and he grabs onto the second rope…"
GHEORGHE: "The Television champion holding onto his chin .. and he’s getting to his feet… I don’t think Black is too pleased about having some of his beard pulled out!" JIVE: "It’s kill or be killed in there, Gheorghe!" GHEORGHE: "I don’t think that analogy really applies to an armbar … but to each his own. Black beckoning Mr. Entertainment .. and the former Television champion finally getting back on his feet." JIVE: "Listen to the idiots… they are actually cursing at the greatest Television champion of all time!" GHEORGHE: "Erik Black clearly the fan favorite." JIVE: "Well we ARE in Idaho.. I bet 75% of these heifers don’t even own a television.. no wonder they aren’t bowing down to Mr. Entertainment! They’ve never seen what he can do!" GHEORGHE: "Well he hasn’t done much so far to show them!" JIVE: "Because he’s in the ring with a cheater!" GHEORGHE: "Erik Black fed up with waiting for Entertainment .. and here he comes! Black with the double ax… no! Entertainment shoots the elbow back into the gut! AND HE SCRAPES THE FOREHEAD OF BLACK AGAINST THE LENGTH OF THE TOP ROPE!" JIVE: "Black’s impatience just cost him there!" GHEORGHE: "Erik Black in the corner now … and Mr. Entertainment with some stiff European uppercuts… and he takes him out of the corner with a fireman’s carry!" JIVE: "Let the lesson in wrestling fundamentals begin!" GHEORGHE: "Entertainment measuring .. and drops the knee right into the shoulder! He pops up … and drops an elbow right in the sternum!" JIVE: "What’d I tell ya, Gheorghe? He needed a second or two to regain his composure .. and now Black is down on his back." GHEORGHE: "The former Television champion grabbing Black by the arm … and … he locks on the chickenwing!! Erik Black stuck in the chickenwing in the middle of the ring!" JIVE: "Tear the arm right off him!" GHEORGHE: "Black in quite the predicament right now … he is stuck in that hold.. and he is far too far away from the ropes!" JIVE: "Entertainment has the hands hooked … and if Black weren’t already hallucinating .. well, he’ll be shortly!" GHEORGHE: "The referee is right there just in case … and Entertainment is yelling at Black to throw in the towel!" JIVE: "There can’t be much oxygen left in Erik Black right now … his lungs aren’t exactly his strongest attribute." GHEORGHE: "The fans trying to rally "The Druid" back into this match …"
JIVE: "Why do they have to try to ruin everything?!" GHEORGHE: "Entertainment straining … the referee keeps checking .. but Erik Black isn’t going to let the match end like this! The fans somehow get even louder!" JIVE: "There’s nothing they can do to help Black now! He’s through!" GHEORGHE: "WAIT!!! THE TELEVISION CHAMPION …. HE’S TRYING TO POWER OUT OF THE HOLD!" GHEORGHE: "THE DRUID .. HE … HE … HE BREAKS THE LOCKED FINGERS OF MISTER ENTERTAINMENT!" JIVE: "Lock them!! Lock them!!" GHEORGHE: "No way, no how, Nick! The chickenwing is broken! Mr. Entertainment is livid .. and now he is on his feet stomping away on the Television champion!" GHEORGHE: "Mr. Entertainment bringing Erik Black to his feet … hooking the head …. And hits the swinging neckbreaker! There’s the cover …. ONE …………. TWO ………. And the Television champion kicks out!" JIVE: "This is all the referee’s fault! I could have sworn that Black gave up in that hold … and the referee ignored him!" GHEORGHE: "Now you’re grasping at straws, Nick.. the referees in New ERA are straight as arrows!" JIVE: "That’s not what Peter File told me…"
GHEORGHE: "Entertainment grabbing the leg of Black .. and he’s going for the figure four … turn… NO! Black with a boot to the backside and Mr. Entertainment goes flying into the ropes!" JIVE: "Don’t let him get back in this!" GHEORGHE: "Entertainment back up quickly .. and he charges in and drops the elbow… BUT BLACK MOVES OUT OF THE WAY!" GHEORGHE: "Entertainment up again … AND BLACK AVOIDS THE ELBOW AGAIN!" JIVE: "This is why we should have a drug policy! Black swallows steroids before the match and Mr. Entertainment pays for it!" GHEORGHE: "Both men getting to their feet now … Mr. Entertainment with the right hook.. but it’s blocked by the Television champion! Black spins Entertainment around … brings him up for the belly to back … BUT MR. ENTERTAINMENT FLIPS OVER AND LANDS BEHIND HIM! Entertainment charging forward… and there’s the rollup off the ropes …"
JIVE: "Black held onto the ropes!" GHEORGHE: "Mr. Entertainment rolls backwards empty handed… BUT HE POPS UP …. AND DROPKICKS THE TELEVISION CHAMPION IN THE BACK OF THE HEAD!" JIVE: "And Black goes tumbling over the top rope! He just landed face first onto the arena floor!" GHEORGHE: "The fans giving Mr. Entertainment a piece of their collective mind …"
JIVE: "Can they really afford that? I mean, if they give him a piece … they have nothing left for themselves!" JIVE: "I have a whole shitload of material I still have to get through before the night is over." GHEORGHE: "Erik Black trying to push himself up … and Mr. Entertainment standing in the ring looking down at him." JIVE: "Entertainment should be out there introducing Black to the steel chairs in the front row." GHEORGHE: "I don’t know what Entertainment is planning … but he is watching Black like a hawk." JIVE: "I hope we got the boys in back on speed dial.. we’re going to have to get the Television championship buffed and ready for Mr. Entertainment." GHEORGHE: "Black on his knees… and he is back up! The Television champion …… INCOMING!" GHEORGHE: "AND MR. ENTERTAINMENT USES THE ROPES TO CATAPULT HIMSELF OVER THE TOP AND ONTO THE TELEVISION CHAMPION ON THE OUTSIDE!! Both men are down!" JIVE: "That would be a dangerous move for any mortal man to attempt .. but Mr. Entertainment is no mortal man!" GHEORGHE: "The fans in the front row standing as both men are strewn out on the arena floor … I think that took almost as much out of Mr. Entertainment as it did of the Television champion!" JIVE: "Except for the fact that Entertainment didn’t have 234 pounds come crashing down on him from 15 feet in the air." GHEORGHE: "The referee starting the count … and it would be disappointing if both men were counted out!" JIVE: "It wouldn’t surprise me… obviously Erik Black is this guy’s dealer.. and you don’t want to upset your dealer!" GHEORGHE: "Mr. Entertainment the first man to move .. and he is using the guardrail to get to his feet." JIVE: "Did you see that?!" JIVE: "That fan just tossed a drink in Mr. Entertainment’s face!" GHEORGHE: "I didn’t see anything of the sort." JIVE: "That’s despicable! These fans have no respect!" GHEORGHE: "Mr. Entertainment resting on the guardrail…"
GHEORGHE: "The Television champion beginning to move!" JIVE: "Mr. Entertainment needs to turn around and stop him before he gets to his feet." GHEORGHE: "Entertainment has his back to Black… and the Television champion puts his hand on the ring apron … …. AND HE IS BACK ON HIS FEET!" JIVE: "But Entertainment sees him!" GHEORGHE: "Mr. Entertainment charges …"
GHEORGHE: "ERIK BLACK MOVES!! MR. ENTERTAINMENT RUNS RIGHT INTO THE CORNER OF THE RING!" GHEORGHE: "Entertainment hits the ring .. and Erik Black from behind … AND GERMAN SUPLEXES HIM RIGHT ON THE ARENA FLOOR!" JIVE: "The referee is at eight!" GHEORGHE: "Erik Black rolling into the ring.."
JIVE: "I told you!! The referee is on his side!" GHEORGHE: "But quickly rolls back out resetting the count!" JIVE: "Oh, I get it .. now they’re trying to avoid any impression of working together.. smooth move, fellas." GHEORGHE: "Black slowly walks over to the challenger .. and he grabs him by the back of the tights…. Black has Entertainment up .. and he rolls him into the ring." JIVE: "I’m going to need a drink after this." GHEORGHE: "Black up the steps .. and he stops to take a few puffs from Dopesmoker!" JIVE: "Mr. Entertainment should be handed the belt right now! Erik Black using illegal substances right in front of everyone here at Taco Bell Arena!" GHEORGHE: "Black steps through the ropes … and he reaches down to pick up the former Television ch…." GHEORGHE: "But Mr. Entertainment with a thumb to the eye stops Black in his tracks!" JIVE: "Looks like that little pit stop cost Black! It gave Mr. Entertainment time!" GHEORGHE: "Black walks to the corner … and Mr. Entertainment trying to get to his feet." JIVE: "If .. no .. when Mr. Entertainment gets up .. it will be the beginning of the end for Erik Black’s Television championship reign." GHEORGHE: "Erik Black trying to shake the effects off .. and Mr. Entertainment is up! Black races out of the corner … AND MR. ENTERTAINMENT DUCKS THE CLOTHESLINE! Black off the ropes… CROSSBODY BLOCK!!! ONE ………….. TWO ……………… THREE!!" JIVE: "NO! NO! Entertainment got the shoulder up!" GHEORGHE: "The referee signaling the two count .. and the fans here at the arena are obviously disappointed." JIVE: "I’d say!! The arena just went silent." GHEORGHE: "Black back up .. and he has the former champion … and they’re heading into the corner!" JIVE: "Time for another break!" GHEORGHE: "I told you, Nick.. this isn’t boxing … there are no round breaks." JIVE: "In this case there should be!" GHEORGHE: "Erik Black with the head of Mr. Entertainment .. and he .. no! Mr. Entertainment blocks it! Entertainment reverses .. AND HE SLAMS THE DRUID’s HEAD INTO THE TOP TURNBUCKLE PAD! ANOTHER! Mr. Entertainment… SPINNING HEEL KICK SENDS BLACK SLUMPING TO THE MAT!" JIVE: "Black took too long .. and now he’s gonna pay!" GHEORGHE: "Mr. Entertainment runs to the opposite corner.. AND HERE HE COMES!" GHEORGHE: "NO!! BLACK PUT THE FOOT UP!" GHEORGHE: "Mr. Entertainment holding his face as he holds onto the ropes… and the Television champion hops onto the second rope …. He pulls Entertainment into the corner … spins him around…"
JIVE: "Entertainment had the ropes! Referee, do your damn job!" GHEORGHE: "Black putting the legs over the shoulders….. AND HE COMES OUT …. VICTORY ROLL!!!! ONE …………………. TWO ……………………. THREE!!!" GHEORGHE: "Jesus!! Mr. Entertainment somehow managed to get out of the pin!" JIVE: "The Television championship is on the line, Gheorghe… and Mr. Entertainment wants the belt back!" GHEORGHE: "Black slams the mat in frustration .. and now he picks Entertainment off …. SMALL PACKAGE!!! ONE …………… TWO …………………. THREE!!!" GHEORGHE: "Two count!! Two count!!" GHEORGHE: "The referee doesn’t agree, Nick .. this match continues!" JIVE: "I want instant replay!" JIVE: "What the hell do we have then to prove that Mr. Entertainment won!" GHEORGHE: "Black back up .. Mr. Entertainment getting up … AND THE TWO MEN MEET FACE TO FACE IN THE RING." JIVE: "They’ve been throwing everything they have at each other .. and even with the referee’s help, Black isn’t able to finish off Mr. Entertainment!" GHEORGHE: "Mr. Entertainment I think is echoing your sentiment, Nick." JIVE: "Great minds think alike!" GHEORGHE: "Entertainment jamming his finger in the chest of Erik Black … and now he turns to walk awa… NO ENTERTAINMENT WITH A CHEAP SHOT! Entertainment with another shot! Entertainment whips the Television champion into the ropes … Black on the return … AND HE ROLLS OUT OF THE WAY OF THE DROPKICK! Entertainment hits the mat!" GHEORGHE: "Entertainment back on his feet … Black on his feet .. Erik Black charges .. and Mr. Entertainment … NO! BLACK WITH THE CRUCIFIX!!! ONE …………. TWO ………………… THR—KICKOUT!" JIVE: "He tried to sneak that one in .. but Entertainment has figured Erik Black out!" GHEORGHE: "Black scrambling to his feet… but the former Television champion is up first! Mr. Entertainment grabbing on the tights.. and he sends Erik Black backfirst into the corner! Here comes Entertainment…"
GHEORGHE: "Erik Black puts up the boot and Mr. Entertainment ran right into it!" JIVE: "He has lead plates in his boot! Someone check his boots!" GHEORGHE: "Entertainment turns….. BLACK … BLACK GRABS HIM ….. HOOKED …... THE BLACKOUT!!!!! Erik Black nails the facebuster powerbomb in the corner!" GHEORGHE: "AND ERIK BLACK IS CALLING FOR IT!" GHEORGHE: "BLACK GOING TO THE OUTSIDE!!!" JIVE: "C’mon, Mr. Entertainment!! Get up!! Stop him!" GHEORGHE: "BLACK IS UP TOP …." GHEORGHE: "420 SPLASH!!!! 420 SPLASH!!!! HE NAILS IT!!!! ONE ………………. TWO …………….."
GHEORGHE: "THREEEEEEEEE!!!!!! ERIK BLACK’s DONE IT!!! HE’s RETAINED THE TELEVISION CHAMPIONSHIP!!!" LINKS: "The winner of this match …. And STILL New ERA of Wrestling TELEVISION CHAMPION …." LINKS: "THE DRUID …….. ERIK …….. BLACK!!!" GHEORGHE: "Erik Black pulling it out at the end … and what a fight put up by the former champion, Mr. Entertainment!! I am calling it right now … these two will have plenty more encounters in the future!" JIVE: "I’m disgusted! Absolutely, positively…." GHEORGHE: "Ladies and gentlemen… for the absolutely, positively disgusted Nick Jive … I’m Tom Gheorghe … and we’ll see you at Cyberstrike from Seattle, Washington!!" LaROQUE: "Where the hell is this guy?" LaROQUE: "This is the last time we’re coming to this hellhole." MAN: "Sorry it took so long." LaROQUE: "I needed this door open an hour ago!" MAN: "I know, I know. I’m here now." LaROQUE: "Who the hell are you and what are you doing in my office?" LaROQUE: "You were in here all this time and you didn’t let me in?!" VOICE: "What can I say, brother?" EDMUNDS: "Well this certainly would have been a huge acquisition for you, Marcus." LaROQUE: "Give me that… I’ve got a lot of work to do to authorize him." LaROQUE: "What is? And give me the damn file." After six years and three months. After sixty one events. EC Enterprises, the funding source behind the league, pulled the plug. Just like that. Not to say that Marcus LaRoque didn’t try to stop his brother from ending it all. He did. After immediately filing suit in the federal district court of Eastern Massachusetts, LaRoque sought an emergency injunction blocking the withdrawal of funds. The judge denied the request. After a five month trial, a trial that drained the remaining resources of the promotion, the final decision came down: EC Enterprises, as sole proprietor, had every right to handle its assets in the way it had done. LaRoque and New ERA were finished. It is not to say that all was lost. While tempers flared, the brothers eventually sat down with their lawyers and worked on a deal. New ERA is a copyright of EC Enterprises. RAUCOUS, RAPTURE, and the championship belts are copyrights of EC Enterprises. Marcus LaRoque, after six years of nurturing his pride and joy, would now have to watch as it was taken away from him, placed in a vault. Sure, he got to keep the contracts of several of the wrestlers on the roster. Sure he got to keep the Cyberstrike name and the pay per view names. But with no funding .. no television deal .. no support, what good were they? Over the summer LaRoque tried pleading with the board of EC Enterprises to provide even half of New ERA’s old operating budget. He was denied. It really was the end. The end of New ERA of Wrestling. But not the end of his dream.